Crafting the perfect pizza crust is actually more science than art. Cooking really is extremely science based (for some awesome science-based food insights, check out Kenji Lopez-Alt’s Serious Eats Food Lab — you’ll thank us later). Some of the most interesting science goes on in the process used to create our dough. I remember prior to Azzip first opening (like maybe a week before), working with Brad and Blake to track each trial batch’s ingredient balances, mix times, etc as we tested and iterated in an attempt to find the ideal recipe for our process. I think I ate the equivalent of three Big Zips that day. We had a goal in mind that day. To create the perfect pizza crust. Golden brown. Crispy yet tender. Slight rise in the dough. Flavorful (of course). We didn’t optimize it in one day, but over time we do think we keep getting closer to achieving our goal. What is the driving force behind achieving our goals? Here are some of the key processes that have to be optimized to create that perfect crust. Why golden brown? Besides looking great, the golden brown color signals the ideal result of the Maillard reaction which produces a lot of the flavor and smell associated with a great pizza crust. Without geeking out too much, the Maillard reaction is a simple reaction between amino acids and sugars that occurs in the crust when baking. Too little browning signaled by too light of crust, and the flavor profile won’t be fully formed. Too dark, and your crust will be bitter and charred due to another unwanted reaction. Some pizza is meant to be floppy. Not ours. We want it to hold its shape without being dry and crackery. So how to get that ideal crust to act a sturdy carrier for delicious pizza ingredients? Gluten and layers. Gluten is formed as the proteins in wheat flour mix with water. The mixing process works these proteins into chains of linked proteins. There is a careful balance in the mixing process. Too little mixing and gluten formation and the crust won’t rise at all and we might as well have used tortillas. Overmix the dough and it creates too many linkages and the dough will be too stiff, won’t stretch properly, and have a chewy texture. One of the unique process steps when rolling out our dough is the folding process. This folding process creates layers in the dough similar to a flaky biscuit or croissant. The outer layer gets golden brown and crisp, the inner layers stay soft and tender and flake apart when bitten into. The rise is developed both slowly through the proofing process and quickly during baking. 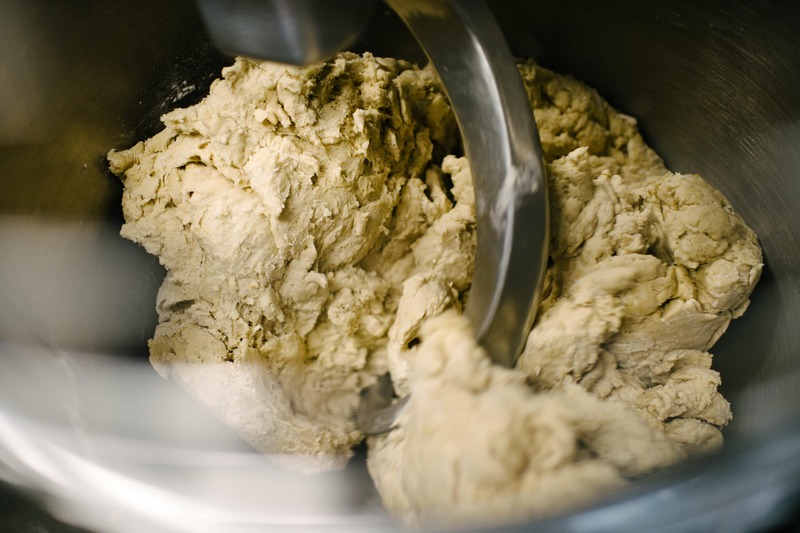 As the dough sits overnight, the yeast in the dough eats the sugars and produces carbon dioxide bubbles producing a rise in the dough as it proofs. Then, during baking under high heat, rapid evaporation of the water molecules in the dough produces additional air pockets in the dough. The layers we create during the rolling process allow for easier expansion of the layers due to less crosslinking of gluten layers. However, to make sure it doesn’t expand too much, we pinch the layers together in a process called “docking”. 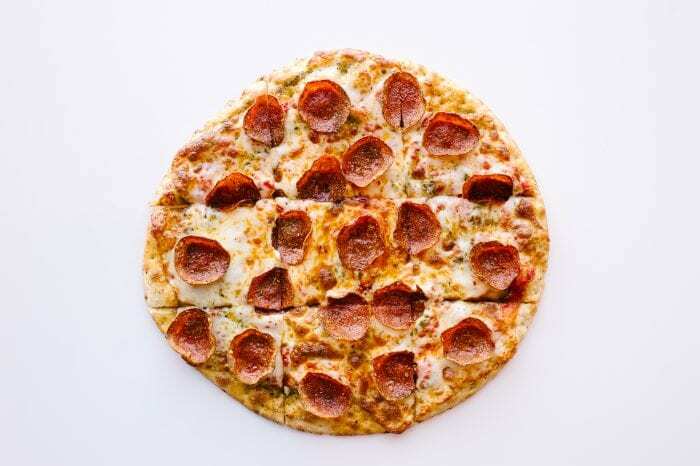 If you ever see a large bubble in your pizza, the pinch points in the dough weren’t strong enough to hold the layers together as the air pocket expanded. Besides the flavor developed from the Maillard reaction, we wanted to take the flavor profile of our crust to another level. How to amp up the flavor? How about substituting oil that is needed in pizza crust recipes with some of our house made pesto? Yep, that sounds like a great idea. Now we get a bit of herbs, garlic, red pepper flakes, and more that make our crust unique. We are always striving to have a consistently great crust. However, with all the different interactions at work, it can be a constant battle requiring slight adjustments. The time of year affects the protein levels in the dough and the amount of water required. Consistency in oven temperature, bake times, and cleanliness also become key drivers to ensure each pizza gets properly baked (as a side note, this is why we like the conveyor ovens to help deliver consistency in temperature and time). Now that you are in the know about how to create the ideal pizza crust, help hold us accountable and let us know if we need to get back to work. We would love to hear from you at www.azzippizza.com/contact-us/.